Create a product that is tailored to the most specific features. Create promotional products that are tailored exactly to your brand and pay attention to the smallest detail. Our custom printing options let you create special print projects or personalized gifts by expanding your choices and giving you extra flexibility. 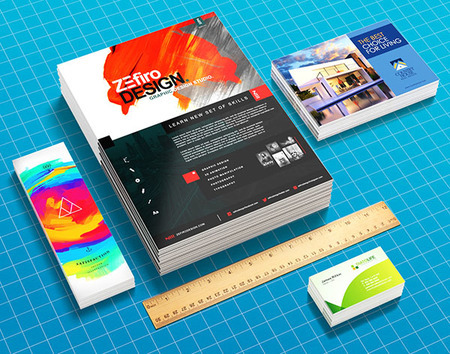 From folded business cards to custom pens, the creative opportunities are endless. We don’t limit the size and specs of your product. You are free to mix, match, and combine materials and finishes with other special features. Specify your product’s width and height from the wide range of measurement on our online calculator. Both width and height start at 2” and are listed in increments of 0.25”. Maximum height is at 18"
We assure high-quality with every small or large order. Our free PDF proof option lets you approve or make changes to the file before printing. This ensures that all details are correct as soon as it becomes press-ready. A polished product is sure to make an impactful first impression on any customer. 70 lb. Paper Uncoated is our lightest paper that comes with a writable surface. 80 lb. Paper has the same weight and feel as standard copy paper, providing both flexibility and durability. 100 lb. Paper is the thickest paper stock available. Its substantial weight and feel does not hinder it from being easy to distribute and carry around. 10 pt Cardstock is the lightest cardstock material available; ideal for double-sided printing and indoor or outdoor displays. 14 pt Cardstock is a good choice for thick, durable products such as business cards and postcards. 16 pt Cardstock is our thickest option, best suited for marketing materials targeting high-end clients or for materials promoting luxury brands. Showcase the uniqueness of your design and highlight its distinct details with coatings applied on one or both sides. Add a feature that will distinguish even the smallest parts of the entire design. Folding separates and organizes different content sections into 2, 3, or 4 panels for easy reading. Choices range from double gate folding, half folding, to French fold and tri-folding. Folding options are explained in detail here. Scoring adds indented ridges that serve as a guide for folding 2-, 3-, or 4-panel products. Paper stocks are not scored. Cardstocks come scored if they are ordered with folding. For flat products, the customer can add scoring, but they will be shipped as unfolded and require manual folding. Rounded Corners give your entire design a sleek, memorable edge that measures ¼” in radius. Usually added to business cards or hang tags. Hole Drilling adds a hole punched in your product to attach a string or lanyard. Customize the hole according to size and a preferred location. Perforating adds a tear-off portion to your design. It gives your flyer, brochure, or card a functional section for customers, such as a discount coupon or order form. Tabbing provides additional protection through a wafer seal that encloses the edges of a flat, unfolded paper. It is recommended for large projects sent through direct mail such as brochures and booklets. Shrink wrapping organizes your order into individual quantities or sets. It allows for easy counting for large quantity orders and provides additional protection to your order. Each order is processed within your preferred number of business days. Many products can be ready for shipping on the same business day. For more information, give us a call and our print experts will be happy to help you create something fantastic from our custom printing services. When can I expect to receive my custom product? The printing turnaround times indicate how long it takes to produce your order. Selecting a same-day printing turnaround ensures that the order is ready within that date. If you add hole drilling, rounded corners, and shrink wrapping, 1 business day is the shortest turnaround time available. Detailed information on our printing turnaround times can be found here. Are there any options that will limit my selection for other features? If you decide to add rounded corners, then the product can’t have folding or scoring. If you require folding or scoring, then you will have to select these and forego rounded corners. What are the most popular sizes for custom print products? Combine and complement custom stocks, finishes, and folds to give your brochures, postcards, and business cards something extra. You can also build a totally new print product from scratch. Either way, our custom printing options let you create something customers won’t forget. Give away freebies. Customers are more likely to remember your company after receiving a free gift along with your customized item. Include a branded notebook or notepad with their purchase or a promotional item with the marketing material. Send them directly to customers. Everyone may be on their phones, but it has yet to replace the unique touch of a printed product. USPS data reports that 79% of customers find reading direct mail easier than searching stuff online.Our Every Door Direct Mail Service adds to the effectivity of your marketing campaign, while saving your business time and money. Choose features tailored to your brand. It is not enough to have a loud, distinct design. Each element should adhere to your company’s specific branding guidelines. Make sure that the colors, shapes, copy, and all other informative elements complement your brand.